World Whisky Day - Celebrate and enjoy a dram or two of Whisky! #WorldWhiskyDay – Celebrate and enjoy a dram or two of Whisky for World Whisky Day! World Whisky Day is a global event one day a year that invites anyone and everyone to try a dram (or bottle!) of Whisky, the water of life. Large and small Whisky events will take place all across the World celebrating the great experience of drinking Whisky. Whether you’d like to attend an organised #WorldWhiskyDay event or you simply want to enjoy a bottle with your friends, we certainly encourage you to do so…responsibly of course! #WorldWhiskyDay was created by Blair Bowman whilst studying in Aberdeen, Scotland as recently as 2012. The idea of the day is simply to encourage new and old whisky lovers to enjoy some great whiskies and embrace the drinking experience. Traditionally, Whisky is seen as an older gentleman’s tipple of choice but more and more bars and restaurants are embracing Whisky and are adding to their selection. How do I take part in #WorldWhiskyDay? You can find a World Whisky Day event near you by visiting the official website. Why not go along with a few friends and taste some great whiskies! We’re sure you’ll meet lots of like-minded people embracing the day, some new and some old to the World of Whisky! I’ve never tried whisky before, is that OK? This is the whole point of World Whisky Day! The idea of founder Blair Bowman is to give everybody the chance to try Whisky! You might not normally drink it or only at any certain times of the year…you might even be converted! What are the best Whisky Glasses? There are a whole host of different glasses available for Whisky, here at Wineware we stock a great and varied selection, from the award winning Glencairn Whisky Glass to the new Norlan Whisky Glass! Click here to view our selection of Whisky Glasses. What are the top 5 Whisky Questions for Beginners? Nothing! Different countries just spell it a little differently. Generally, the rule of thumb is that if a country has an ‘e’ in its name it usually spells Whiskey with an ‘e’ in it – ie – America – whiskey – Japan – Whisky. Why do people add Water to their Whisky? To slightly dilute the strong alcohol – water, even in a very small amount sometimes makes the whisky appear more rounder and smoother and enhances the flavour. It is however purely personal to each drinker – some like it straight and some always like to add a little water. Anywhere where there is good access to a good water source and the necessary raw ingredients such as barley or alternative cereal crops. Scotland, Ireland, USA and Japan are the most popular Whisky producers in the World! What are the different types of Whisky? Single Malts, Blends and Grain. Are there any similarities with Whisky and Wine? Not really! A lot of casks that have held wine in a previous life are often used in the maturing process of Single Malt whiskies, this is probably one of the only links between the two. 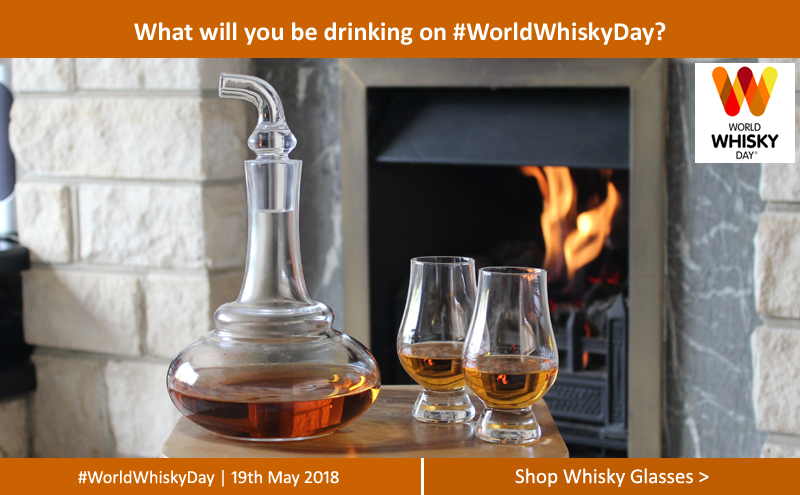 If you’ve organised your own or are attending a World Whisky Day event, let us know and share your experience with us! Use our social channels to get in touch, via Twitter, Facebook or Instagram!